A heads-up to all you transportation fans about the following cool event. 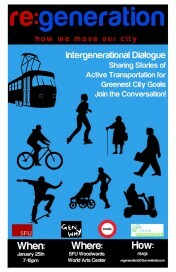 It’s an intergenerational dialogue on transportation issues that takes place on January 25 (7-10pm) at SFU Woodwards World Art Centre. We had a chance to chat with the organizers early in the planning stage and are pretty stoked. They have a great collection of participants lined up and have created a program that touches on the city’s transportation past, present and future. It’s the first of 4 regeneration events being organized over the next 4 months – each one focusing on a different Greenest City Goal. The other events will be on Zero Waste, Greening the City and Local Food. You need to register to attend. To do so go to the Eventbrite webpage and follow the steps. Ever wonder about Vancouver rail transit in the 1950s? or the future of automobile ownership? Or wondered what “Active Transportation” was? …. well ….